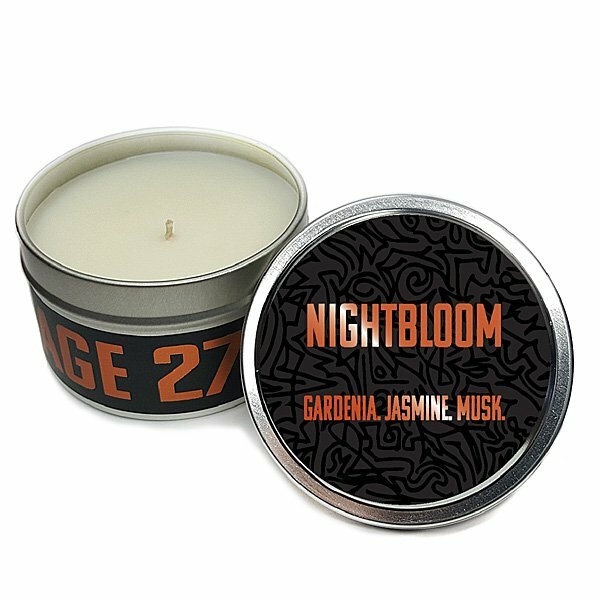 Vintage 27 Nightbloom Travel Tin is Vintage 27 Candles' walk alone in the garden after the dark has taken hold. Vines of nightblooming jasmine entrance the shadows cast through moss laden gardenia and magnolia lined paths. A sudden note of musk quickly startles and fades into the warm night air as if a stranger had passed, leaving a final hint of tonka bean amongst the flowers. Gardenia. Jasmine. Musk. VINTAGE 27 is a luxury brand offering fine fragrances & distinct style, a specially curated blend of essential oils & high quality fragrance designed to invoke an environment with every burn. Poured in Hollywood, California. Luxury...skewed.